At Candy Crate, online at candycrate.com, you'll find candy galore. Candy Crate offers all the candy you can think of and even more. 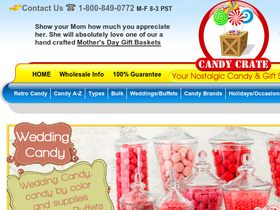 Candy Crate offers bulk candy, retro candy gifts, wholesale candy, and more. At Candy Crate they let you shop by category among which are holiday candy, novelty candy, theme candy, sugar free candy, candy by color, easter candy and the list goes on. You're guaranteed to find all the candy you are searching for. Candy Crate even makes fabulous gifts. So get all candied out with Candy Crate and remember to check out RetailSteal to find the best Candy Crate coupon codes, Candy Crate discounts, and Candy Crate promotions. Most Candy Crate orders are shipped via USPS Standard shipping although 3rd Day, 2nd Day, and Next Day Air are also available. Shipping rates vary depending on destination. International shipping is available. See website for full details, exclusions may apply. Use our coupon code online at Candy Crate today and save 10% on your purchase. Shop online at CandyCrate.com and enjoy a 50% discount on select candy. Click link to start shopping. Head over and save 10% at Candy Crate with our exclusive coupon code. Enjoy a 12% discount on purchases of $250 or more online at Candy Crate today when you enter our coupon code at checkout. Head over to Candy Crate today and receive savings of up to 20% on gumball machines and refills. Save 5% on your Candy Crate purchase with this coupon code! Check out Candy Crate's large selection of party favors, only $2.48 each. Use this promo code at Candy Crate and get free shipping with your purchase order of $65 or more.